Catherine Lemkuil and Christopher M. Arthur were married at 2 p.m. Dec. 14, 2013, in Williamsville United Methodist Church, Williamsville. Guests gathered for a reception at Hotel @ The Lafayette. The Rev. Richard W. Neal of Williamsville United Methodist Church heard the couple’s vows. The bride’s mother is Jeanetta M. Hanlon of Buffalo. The bridegroom’s parents are Merrill W. and Elizabeth Arthur of Getzville. The bride is a graduate of Nardin Academy. She earned a bachelor’s degree in marketing from St. John’s University. The bride is a business analyst at United Healthcare. The groom is a graduate of Williamsville North High School. 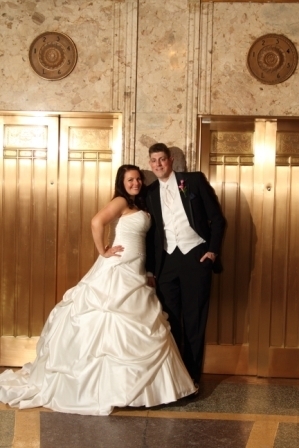 He earned a bachelor’s degree in technology education from SUNY Oswego, The groom is a fabricator at An-Cor Industrial Plastics. After a trip to Punta Cana, Dominican Republic, the couple are making their home in North Tonawanda.